Anthony Murdaca will take what appears to be an unstoppable lead into the final day of the Asia-Pacific Amateur. Murdaca is at 12-under following rounds of 69-68-67 to be eight stokes from his nearest rivals, Pan Cheng-tsung, Jin Cheng and fellow Aussie Todd Sinnott moving into the final round. Should Murdaca be holding the trophy come Sunday afternoon he’ll also be booking his flight to next year’s Masters, the extra ‘spoils’ that goes to the Asia-Pacific Amateur champion at The Royal Melbourne Golf Club this week. “I’ll be taking it one shot at at time,” said Murdaca about playing in tomorrow’s final round and the prospect of playing the Masters at Augusta next April. Murdaca’s third round of 5-under 67 included an eagle on the 17th, which came narrowly close to being an albatross missing the lip by an inch, and four birdies. His only blemish, a bogey on the 439 metre 11th. “I was hitting it well all day off the tee,” said Murdaca. Three players bettered 70 on a day where many struggled. Murdaca, Japan’s Horikawa Mikumu shooting the same round as Murdaca’s 67 and Drakeford storming up the leaderboard with a 3-under 69. “It was solid, wasn’t fantastic but it was what I was after,” said Drakeford. Murdaca has played his way into the box seat in this championship with three rounds of flawless golf with three rounds in the 60’s against an international field where the majority have struggled reading the greens. He is not the only Aussie to be performing well this week either at Royal Melbourne. 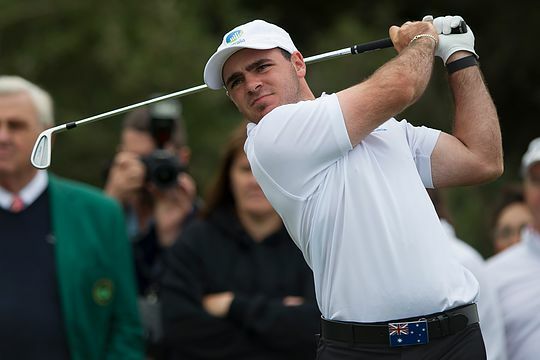 Ten Aussie players started in this championship and all made the cut and five, including Cory Crawford and Ryan Ruffles, who are inside the top-10 with Ruffles firing a third round 75 on a day where he desperately tried to make his move. Tomorrow will test Murdaca’s capacity to perform under pressure. An invitation to the Masters aside, Royal Melbourne is a layout which can jump right out and hurt a player who shows no respect for this majestic layout, which in itself is another type of pressure players this week have experienced. Yet, Murdaca has handled it well and appears to be in control as he goes in search of his biggest amateur win to date that will add to his dual Australian Junior titles he won in 2010 and 2013.